I'm a coffee lover and I like coffee whatever name may have: coffea, kafe, cafea, kahva, masbout, kafei, sourj, kava, buna, kafes, gehve, koohii, gafae, kalawa, etc. - or to chat over with friends at Mc Donald's, Starbucks or other coffee shops in Malls while watching the crowds. Did you know about coffee? - the word"cappuccino"comes from the 16th century Capuchin order of friars, whose hoods were called cappuccinos. A cappuccino is a coffee topped with steamed milk. - instant coffee was invented by George Washington in 1906. - a cup of drip brewed coffee has about 115 milligrams of caffeine, an espresso (and percolated coffee) about 80mg, while instant coffee has about 65mg of caffeine. Decaffeinated coffee is not totally caffeine free, containing about 3mg of caffeine. A 8oz can of Coca-Cola has about 23mg of caffeine, Pepsi Cola 25mg, Mountain Dew 36mg, and TAB 31mg. Tea has about 40mg of caffeine, while an ounce of chocolate contains about 20mg. - the world' best coffee grows only in the so-called Coffee Belt, a region between the Tropic of Cancer and the Tropic of Capricorn. - the first Espresso machine was introduced in 1822 by the French, but it was the Italians who perfected and distributed it. - it is said that more than 3 cups of regular coffee in a day could lead to tachycardia and sleeping disorder. - in USA was published recently a survey according to which coffee has a beneficial and protective effect against breast cancer, bladder, kidney, intestine diseases and diabetes conditions. Southeast Asia, South Asia and Africa. Green (unroasted) coffee is one of the most traded agricultural commodities in the world. Coffee can have a stimulating effect on humans due to its caffeine content. It is one of the most-consumed beverages in the world.Coffee has played a crucial role in many societies. 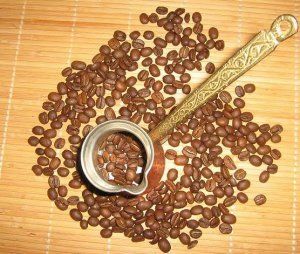 The energizing effect of the coffee bean plant is thought to have been discovered in the northeast region of Ethiopia, and the cultivation of coffee first expanded in the Arab world. 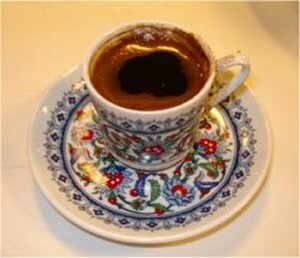 The earliest credible evidence of coffee drinking appears in the middle of the 15th century, in the Sufi shrines of Yemen in southern Arabia. From the Muslim world, coffee spread to India, Italy, then to the rest of Europe, to Indonesia, and to the Americas. In East Africa and Yemen, it was used in religious ceremonies. As a result, the Ethiopian Church banned its secular consumption, a ban in effect until the reign of Emperor Menelik II of Ethiopia. It was banned in Ottoman Turkey during the 17th century for political reasons, and was associated with rebellious political activities in Europe. Coffee berries, which contain the coffee seeds or "beans", are produced by several species of small evergreen bush of the genus Coffea. The two most commonly grown are the highly regarded Coffea arabica, and the "robusta" form of the hardier Coffea canephora. The latter is resistant to the devastating coffee leaf rust (Hemileia vastatrix). Once ripe, coffee berries are picked, processed, and dried. The seeds are then roasted to varying degrees, depending on the desired flavor. They are then ground and brewed to create coffee. Coffee can be prepared and presented in a variety of ways. An important export commodity, coffee was the top agricultural export for twelve countries in 2004, and it was the world's seventh-largest legal agricultural export by value in 2005. Some controversy is associated with coffee cultivation and its impact on the environment. Many studies have examined the relationship between coffee consumption and certain health conditions; whether the overall effects of coffee are ultimately positive or negative has been widely disputed. The method of brewing coffee has been found to be important to its health effects. Drip coffee has almost double the amount of caffeine instant coffee does. One of the most popular Coffee Recipes resources on the internet. Lots of different types of delicious coffee to try. Things you should know but probably don't about caffeine and coffee.It is said that the average coffee tree has a "life expectancy" up to 70 years, which is comparable with the length of a human life. So, ready for a friendly tasty cup of coffee?